Some people hold great “store” by the labelling of food in their shops and supermarkets. I noticed this myself recently while buying some spuds for dinner. As usual there is a goodly selection to choose from . There are earth apples from Israel, Spain , Ireland and the UK.Lovely white Cyprus potatoes to be simply scrubbed clean ,boiled and eaten skin and all. Then there are the Blues , the Bakers, the Balls o’ Flour ,the King Edwards,andthe Little (or sometimes , big) Red Roosters….pommes de terre of every variety…..but what’s this ? 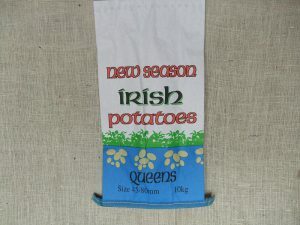 Here are some “Queens”, which on closer inspection ,are not potatoes especially bred and harvested for our gay fraternity , but in fact ,on a more than cursory perusal , these are actually truncated ” Queens” masquerading under a nomme-de-plume….or a nomme de pomme , possibly.These particular tubers are apparently Ireland’s favourite Summer spud. Ahah! …the penny drops finally! There on a smaller price tag , in diminutive print ,is the appellation “British Queens “. Immediately I know we’re back in the same territory as the recent Orange Drink saga.Remember Volvic, the drinks company, decided it would be best not to advertise their “Orange And I’m Proud” drink in Norneverland ,under that particular slogan, because they immediately assumed that they’d cut off half of their market -share by offending over -sensitive Keklicks who have a distaste for any associations with the Orange Order .You know how it is …the minute the word “orange” is mentioned in Norneverland , half the population cheer and let off fireworks or light Big Bonfires and the other half of the population slap their brow sharply with a sharp “twack!” sound and get case of the collywobbles…It’s all to do with history …look it up……No….. best not mention anything “orange” and try not to mention anything “green ” either . Granted ,that’s a difficult task in a place like Norneverland, Ireland where the numerous shades of that particular colour is a big selling point for the tourist industry. I have no real problem with the labelling or origin of most things unless it was something like buying wine or oranges from South Africa during apartheid. Nowadays we probably couldn’t buy anything at all if we studied its origin carefully …all those sweat -shops producing our clothes and electronics across the planet.We’d all be walking about naked or wearing Aran sweaters down to our knees because our conscience wouldn’t let us wear a pair of jeans we’d bought for twenty quid that had been made in some Indian village by a six-year old. We’re all hypocrites in some respect but these sensitivities are not purely a local affair. In the UK Tesco, the huge supermarket chain ,has started its own little war by branding normally “Scottish” strawberries as being “British”.Apparently the source of this has been related to some English customers in the south of the island complaining about the presence of the blue and white Scottish Saltire on the packaging. These southern English didn’t like that one -little- bit ,apparently, and were vocal enough to have the packaging changed to bear their proud union-jack flag.Some Scots then got up a head of steam and irately demanded that should there then be complaints from Scottish strawberry- lovers in the north as to the provenance of their favourite fruit , then would that decision be reversed and the Scottish flag be re-appointed. As we all know by now , these things are very important to some people’s notion of themselves and their identity. Wars have started over less…..We’ll they’ve started riots on our own streets a couple of years back , for example because the union jack flag wasn’t allowed to be flown willy-nilly anymore. The humble strawberry could even be the fruit that tilts that supermarket scale in favour of Scottish independence from those southern Little Englanders , at some near future date.Stranger than fiction , alright! Michael Noonan: are you Nanki-Poo in disguise? The Praties, they were small, but we ate them skin an’ all. They were better than Feck All over here. and the replies of its customers. plenty of variety yesterday at the fair,seen a couple of yanks lol,ing at the seaweed,(dulse)i think they bought a n.ireland beg of yellaman,all the spuds were balls of flour according to yer man with the birds nests growing out of his lugs. Very good Harry the absurdity of it all did make me smile. I’m not sure if Supermarkets have a low opinion of our tolerances or if they have hard evidence to prove it affects sales. On the subject of potatoes though, you may be too late to get your hand on some but if you find any Comber earlies buy them. They’re a first class spud. Scott ….my late grandfather would travel miles to buy seed-spuds for a blue-skinned tater which he invariably called his “lovely purties”. Shop in the Moy, harry, sells Dublin Queens. Likewise in Thomas Street. Good stuff fiosrach…I wonder is the flavour any different under the skin , eh? I remember my father had elongated spuds with purple skins and the flesh was totally blue. He called them banana blues and they were much sweeter than normal spuds. If rats were about they were the first to disappear. I think they came from Cavan but not really sure. Psychedelic spuds! !,Batman….er … fiosrach!…I like the sound of those colourful babies! Idaho potatoes, the best in the world. Some of you may be interested to know that British Queens contain a rather high level of poison…. Martin McGuinness be warned!! It’s a fact that all spuds can be poisonous. Keep away from any with a green tinge to them .All spuds contain a poison called solanine which is the plant’s natural defense against insects but it can cause a variety of illness and even hallucinations.The poison is made at the same time as the green chlorophyll so they usually go hand- in -hand. You’ve been warned .Beware the green!